This soup is part of a larger meal “A Taste of Autumn” where every single dish was made using “edible” or natural “bowls.” That post is my entry for Project Food Blog Round 6. You can check out the post and vote for me here. Can you believe it was 70° F in Boston yesterday? I feel almost funny posting about a warm, autumn soup. Perhaps it’s time to go back and have a duck confit salad or gnocchi with summer tomatoes. Dream on. This warm weather is only temporary, and by the time the weekend rolls around, we will be back to having our cool and dry fall weather again. 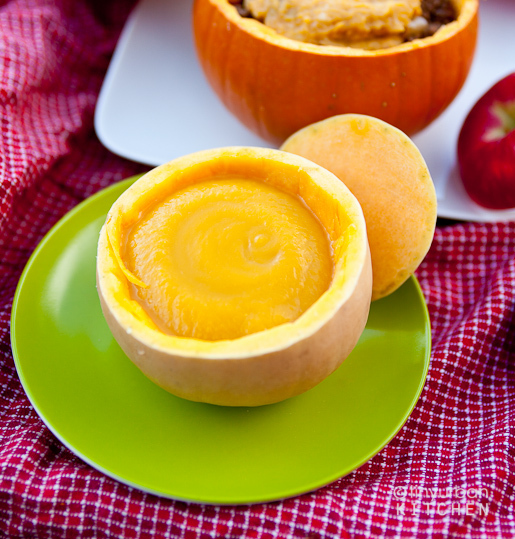 Slightly nippy fall weather is perfect for autumn squash soups. In general, I love blended fall soups. They are easy to make, present beautifully, super healthy, and soooo satisfying on a chilly fall evening. For all these soups, the basic technique is the same, yet the variations and possibilities are endless, giving you the freedom to be as creative as you want. In this case, my twist was the addition of maple syrup, which added a nice, caramel sweetness that I think deepened the flavors of the soup. I also added a bit of salt, and that’s it! Of course, you can add whatever flavors you like in your soup. Maybe some cinnamon or nutmeg in a pumpkin soup? That’s it! Saute aromatics in oil or butter until soft. Add squash and broth and cook until the squash is soft. Blend and add flavoring ingredients to taste. So easy! You can serve the soup in its own shell. This is not only economical and environmentally friendly, it’s also beautiful and totally fits the season! I don’t really use a recipe, but for those of you who like having a real recipe, I’ve included below a short write up of what I usually do. Saute onions in about 1 T of butter over medium heat until soft and slightly caramelized, about 5-8 minutes. Add squash and broth and bring to a boil. Cook at medium heat for about 15 minutes, or until squash is soft. If you have a hand blender, use the hand blender to puree the soup. Otherwise, in small portions, blend in a traditional blender. Add maple syrup and salt to taste. Serve hot. Love the sound of the soup, and how cute to present and serve back in the shell, very cute. I love the soup and the squash bowls. This is a great idea for picnics and small parties.